Yesterday, Veronique noted that the meanings of words often get jumbled when politicians and pundits talk about austerity. Tax increases, spending cuts, and structural reforms all fall under the label “austerity.” But only some of these measures actually work. And only some of them are actually being tried. Maybe it is time for some new words? On Sunday, Anthony Sanders posted a number of informative charts showing recent trends in the UK economy, including: repeated dips into negative GDP growth over the past couple of years, massive sovereign debt, rising unemployment rates, and an over-built financial sector. On the plus side, the UK is still paying comparatively low interest rates on its debt and its housing market has not fallen as far the US’s. Current spending rose in cash terms from £604.8bn to £617bn in 2011-12. 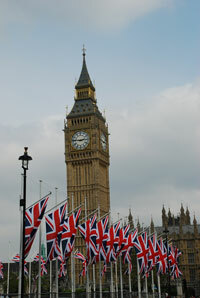 The OECD says UK public spending was 49.8 per cent of GDP in 2011. Public sector net borrowing remains at a catastrophic 8.3 per cent of GDP. All of this remains utterly unsustainable – yet the public have wrongly been told that the UK “is tackling its debt”. Osborne has been a disappointing chancellor – but not for the reasons cited by the left. This entry was posted in Austerity and tagged Allister Heath, Anthony Evans, Anthony Sanders, GDP, spending, tax, UK, US on May 2, 2012 by Matt Mitchell. Does UK Double-Dip Prove that Austerity Doesn’t Work? The U.K. has slipped back into recession and Paul Krugman thinks this is evidence that austerity doesn’t work. Is it? Will it work? Will it actually cut the debt? Will it hurt? Will it harm the economy or might it actually be stimulative? What mix of spending cuts and tax increases yield the best answers to questions 1 and 2. Sadly, most austerity efforts fail. According to research by Alberto Alesina, about 84 percent of fiscal reforms fail to substantially reduce a nation’s debt-to-GDP level. We’ve known for a while that austerity can be stimulative. Even left-of-center economists such as David Romer have acknowledged this possibility. But the evidence on this is decidedly mixed. As Alesina put it in his Mercatus working paper, austerity is about as likely to be stimulative as…well…stimulus. And we know the economics profession is quite divided on stimulus. So you shouldn’t hold your breath hoping austerity will boost economic growth. But remember, that’s not why we should be pursing austerity. We should pursue austerity because we know that we are on an unsustainable fiscal path and that in the long run, too much debt is very bad for growth. Furthermore, we know that the longer we put off reforms, the more painful they will have to be. Lots and lots of papers* have now studied this question and the evidence is rather clear: the types of austerity that are most-likely to a) cut the debt and b) not kill the economy are those that are heavily weighted toward spending reductions and not tax increases. I am aware of not one study that found the opposite. In fact, we know more. The most successful reforms are those that go after the most politically sensitive items: government employment and entitlement programs. Lastly, there is evidence that markets react positively when politicians signal their seriousness by going against their partisan inclinations. In other words, the most credible spending reductions are those that are undertaken by left-of-center governments. So slash away, Mr. Obama! I summarized these issues in this summary and in this presentation. Given what we know about austerity, my advice to the UK would be: tweak your austerity measures so that they are more spending-cut-focused and less revenue-increase-focused. And go after the most politically-sensitive items. I wish I knew more about what they actually did, but my knowledge of this is limited and I’ve frankly heard conflicting reports (apparently in the UK, there are just as many arguments over the proper baseline as there are here in the U.S.!). Francesco Giavazzi and Marco Pagano, “Can Sever Fiscal Contractions Be Expansionary? Tales of Two Small European Countries,” NBER Macroeconomics Annual, (Cambridge, MA: MIT Press, 1990), 95-122. This entry was posted in Austerity and tagged Alberto Alesina, American Economic Review, Economic Conditions, Economic Policy, economy, European Economic Review, Fiscal Adjustments, fiscal policy, growth, Hughes Halite, Jose Tavares, OECD, Public Choice, Roberto Perotti, Silvia Ardagna, spending, Stephanie Guichard, Swedish Economic Policy Review, tax, UK on April 26, 2012 by Matt Mitchell.